If you have WebDriver APIs in your test methods, You’re Doing It Wrong. In my career I’ve been lucky to have exposure to a handful of Webdriver implementations including suites using bindings from Java, PHP, Python, Ruby, and even some Python. In every case regardless of which language your team decides to use with Selenium the fact remains true that if you ignore the page object pattern and use the Webdriver API directly in your test methods you’re going to have a bad time. // Don't try this at home, use page objects instead! While the latter approach with page object element definitions may appear to take more work upfront to implement the long term benefit to efficiency is well worth it. Once elements are defined in a page object there is a single canonical definition for the UI selectors so any changes to UI code that break a selector can be fixed in a single location rather than having to hunt down dozens if not hundreds of ad-hoc element selectors in test cases that are failing. // This is bad and I should feel bad for writing it. In the second example using page objects we’ve completely abstracted all Webdriver API method calls into the page object leaving the test case with a human readable domain specific language that describes what actions we want to execute for this test. If any changes are made to the login flow in the future we have a single location to make necessary updates to our test code. As an example imagine if an additional field was added to our login form for answering a security question as part of the login process. We would easily be able to add this to our page object by defining a new element selector for the security question field and adding an additional .setValue() Webdriver API call to the .signInAsAdmin() page object method. Now every instance of the .signInAsAdmin() method in our tests is updated at once. 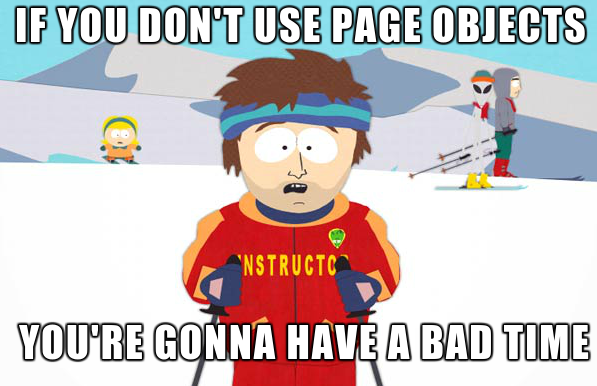 So there you have it, the absolute basics of using page objects with nightwatch.js. I dare you to come up with a reason why using the Webdriver API in your test methods is the right way now. I can’t think of one, anyway you slice it the maintainability and efficiency of your test cases will improve once you start DRYing things up with page objects. Plus nightwatch.js provides tons of support for the page object pattern so there’s no real excuse for ignoring this design pattern. Did I miss anything? Feel free to chime in within the comments below with your thoughts! Like this post? Tweet me about it!